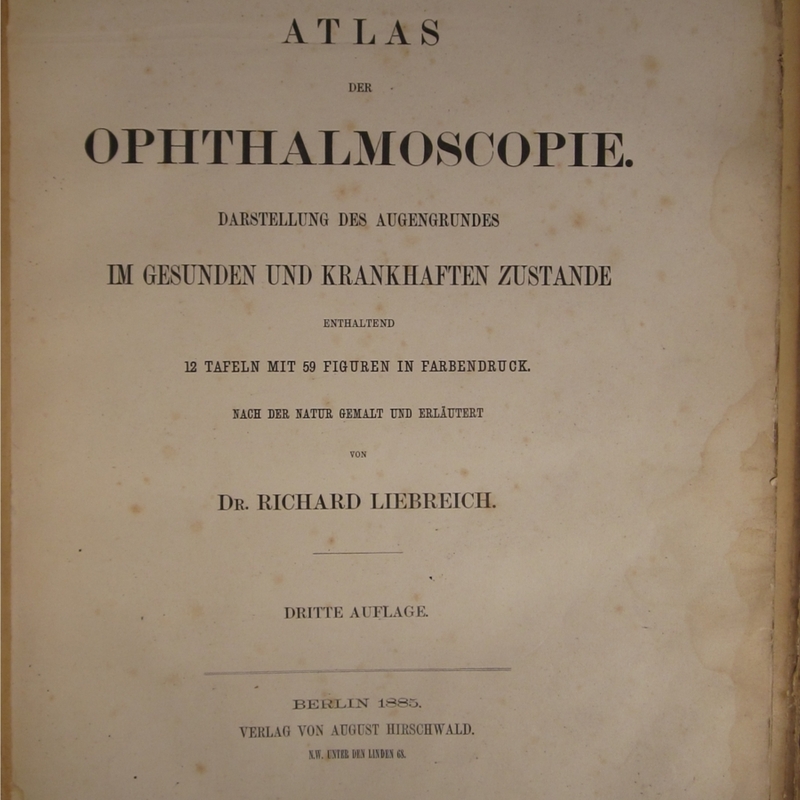 Atlas der ophthalmoscopie : darstellung des augengrundes im gesunden und krankhaften zustande enthaltend 12 tafeln mit 59 figuren in farbendruck. Nach der natur gemalt und erläutert / von Dr. Richard Liebreich. This book came to the College from the library of the Glasgow Eye Infirmary, having previously belonged to Andrew Freeland Fergus, ophthalmologist and former President of the Faculty of Physicians and Surgeons of Glasgow. It was in quite poor condition when it was scanned - the binding had all but fallen apart, and this allowed us to get better pictures of each page. Once scanning was complete it was sent away for conservation. The book has recently returned from the conservator's workshop; it's now housed in a lovely new binding and stored alongside our rare book collections. Richard Liebreich (1830-1917) was a German ophthalmologist and physiologist. In addition to this volume, the College library holds a similar atlas from 1863 and a short pamphlet. 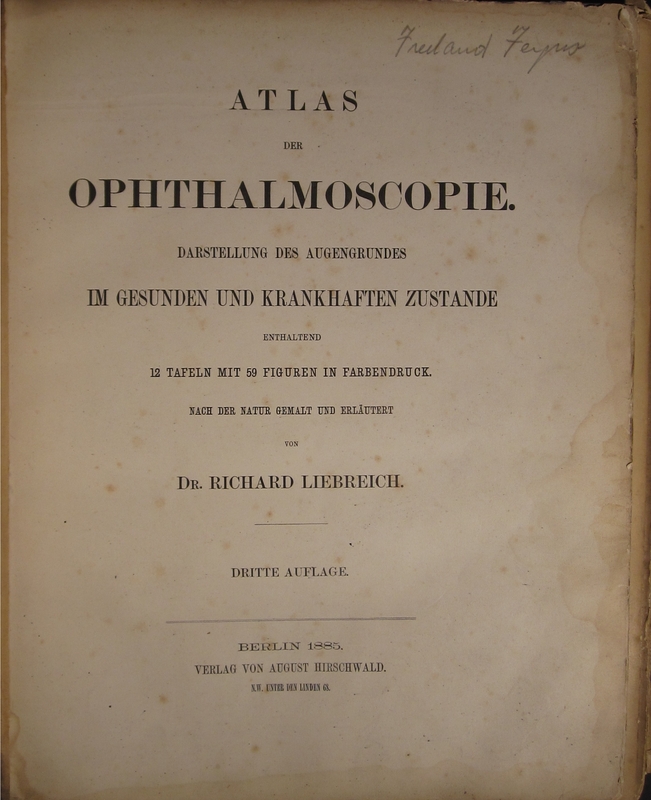 Liebreich, Richard, 1830-1917, “Atlas Der Ophthalmoscopie,” Heritage, accessed April 23, 2019, https://heritage.rcpsg.ac.uk/items/show/190. Description: Atlas der ophthalmoscopie : darstellung des augengrundes im gesunden und krankhaften zustande enthaltend 12 tafeln mit 59 figuren in farbendruck. Nach der natur gemalt und erläutert / von Dr. Richard Liebreich.